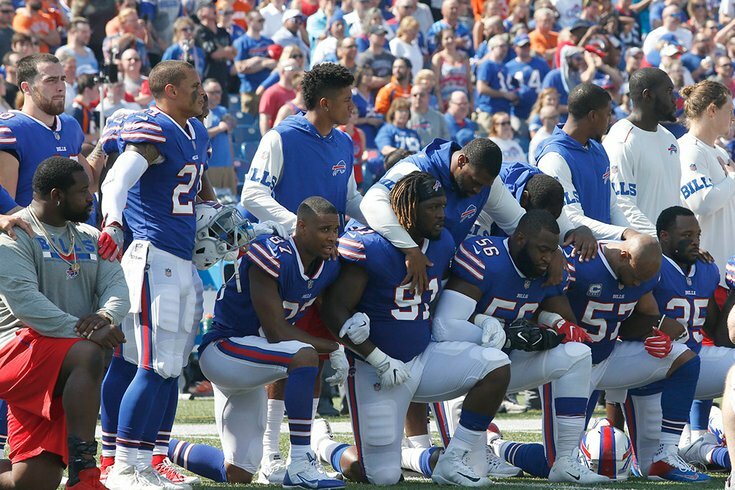 Buffalo Bills players kneel in protest during the national anthem before a Sept. 24 game against the Denver Broncos at New Era Field in Orchard Park, N.Y.
Editor's note: On Tuesday, Michael E. Waters watched PhillyVoice's Jimmy Kempski discuss President Donald Trump's diss of the Philadelphia Eagles on “Hardball with Chris Matthews." He said he felt compelled to write to us. As a retired military officer I reiterate my support for the young men who choose to kneel as a protest against racial injustice and police brutality. The NFL owners' action is not about patriotism as they are no more patriotic than the players who protest. The owners are simply trying to protect their profits. I continue to support the players who protest because when I was commissioned I took an oath to support and defend the Constitution of the United States against all enemies foreign and domestic. I didn’t get to pick and choose which amendments to the Constitution or whose rights and freedoms I supported and defended. The First Amendment to the Constitution protects freedom of speech, the press, assembly, and the right to petition the Government for a redress of grievances. In defending the First Amendment rights and freedoms of all Americans this included, for example, the rights of bigots, white supremacists and others to assemble in the town square, call me a n****r and tell me that this is not my country. Now if I could defend their rights, I damn sure can defend the rights of young men who have simply chosen to kneel as a protest against racial injustice and police brutality. They are not anti-military nor are they attacking police officers or advocating violence and I applaud them for standing up (or kneeling, in this case) for their convictions. While I love our flag and stand at attention whenever I hear our national anthem, I did not serve to defend the flag or the anthem as these are symbols. I proudly served to defend the actual rights and freedoms of all Americans as outlined in the Constitution of the United States. Michael E. Waters is a retired lieutenant colonel in the U.S. Air Force. He lives in Alabama.